Road emergencies happen to the best of us and can come in many different forms. It could be as simple as a flat tire or as complicated as a full-blown pileup. When faced with these emergencies, it is vital that you maintain your composure, but also that you act swiftly and decisively. The following is a guide to help you deal with roadside emergencies brought to you by show plates direct. If you are going on a long journey, it is very important to begin by preparing yourself for the worst you can experience on your journey. The very first thing you should do is get an emergency breakdown cover. Even if your car is brand new and super reliable, there is no telling how the machine can fail which is why having a qualified mechanic on call is always a good idea. You should also always carry with you a copy of your car owner’s manual. If you don’t have one, you can find one online or from your dealer. The manual will show you what various warning light mean, the car’s correct tire pressure, where all the important stuff is and even how to change a tire. If your journey involved traveling in the snow, you might want to bring a change of warm clothes, some blankets, bottled water, and some food. A warning triangle is also important to bring with you in case of break down. You may also want to bring a shovel to dig yourself out of the snow should you get stuck, an ice-scraper and a de-icer. Finally, remember to pack an LED flameless flare which can be attached to your car to warn other drivers and ensure your phone is fully charged. Battery faults ate responsible for vehicle breakdowns. As such it may become handy to know how to jump-start a dead battery although you will need another car with a sound battery to do this. Begin by turning off the ignition and all electrics in the car. Then connect the positive jump lead clamp (usually red) to the battery terminal of the other car and the dead battery. Connect the negative terminal (usually black) to both batteries. Check to make sure you have the connections correctly since doing it wrong could cause serious damage to the car’s electrical systems and even cause an explosion. With everything correctly connected, start the car with the good battery and wait five minutes while the dead battery recharges. If this doesn’t work, call a mechanic. 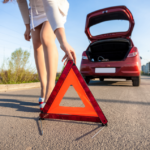 Sometimes you may need to jumpstart the car although you will need a clear run of the road and someone else to push the car. To jumpstart the car, sit in the driver’s seat with the handbrake on and the car in second gear. Your foot should be on the clutch, and your ignition fully switched on. Release the handbrake but keep your foot on the clutch. Get someone to push the car and build up speed as much as possible, before releasing the clutch and pumping the accelerator. The car should jump and start. Take note of the exact time and location of the accident as well as the number plated of the vehicles involved.